Next generation of controllers bring new features, increased performance, and added value. January 15th – Wood Dale, IL – Tempco Electric Heater Corporation, one of the world’s leading manufacturers of custom electric heating elements, temperature controllers, temperature sensors, and process heating systems, announced the launch of it’s all new TEC Temperature Controllers. The all new TEC controllers are available now and offer several new features to make it the new standard for temperature, pressure, flow, and humidity control. Tempco continues to add compelling products to it’s lineup. Along with the various features mentioned, the new TEC Controllers include the following agency approvals: UL, cUL, CE, RoHS, REACH, W.E.E.E. 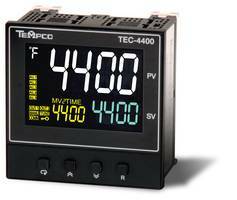 New Tempco TEC Temperature Controllers are available now. Visit www.tempco.com/Tempco/Featured/TEC-Temperature-Controllers-LCDSeries.htm for details. Tempco was established in 1972 and custom manufactures electric heating solutions for original equipment manufacturers and end users worldwide. Our products are sold both nationally and internationally through a network of sales representatives and distributors and through our own distribution center located in Mexico City. Tempco stands behind its premium quality products, expert customer service, and industry leading turn-around times for order sizes small and large. If you would like more information about this topic, please visit www.tempco.com or send an email info@tempco.com.